Egypt announced on Monday the dispatch of humanitarian aid to South Sudan to relieve the suffering of civilians caught up in the civil war there. 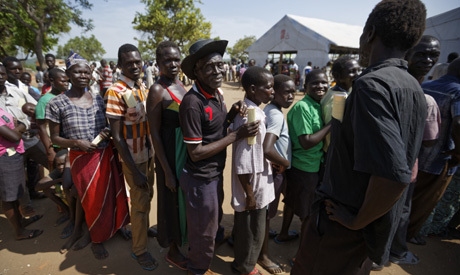 The batch of aid, including food and medical supplies, is the first of several that Egypt plans to send to the South Sudanese capital of Juba in the coming months, according to an official statement. The humanitarian aid is being shipped to Juba by the Egyptian military on the instructions of Egyptian President Abdel Fattah El-Sisi. South Sudan descended into civil war in 2013 after President Salva Kiir, an ethnic Dinka, fired his deputy Riek Machar. The ensuing violence has killed more than 10,000 people and displaced more than 2 million, many of whom have fled to neighboring Uganda, Ethiopia, Kenya and Sudan. War and famine have forced more than 2 million children in South Sudan to flee their homes, according to the United Nations. Egypt has more than once expressed support for a peace agreement in South Sudan. Kiir visited Cairo in January for talks with El-Sisi, including boosting bilateral relations and the latest developments in the Nile Basin and the Horn of Africa.